Police in Saraland, Alabama, said a disturbance at a Waffle House there very early Sunday morning that led to a viral video had nothing to do with the cost of plastic utensils and everything to do with the alcoholic beverage the guests brought in with them. When the group of three were asked to leave by restaurant staff for bringing in the outside beverage, two complied, but 25-year-old Chikesia Clemons did not, police said at a press conference Monday afternoon. Instead of leaving, Clemons approached workers behind the counter. She was “being loud and using profanity,” according to Saraland Detective Brian Mims. A video of her resulting arrest, recorded by one of Clemons’ friends, went viral Sunday and prompted a protest at the restaurant. That graphic video shows three white male police officers putting the black woman into handcuffs. She resists and is forced to the floor from the chair where she had been sitting, a process that also pulls down her dress and leaves her breasts exposed. Saraland Detective Collette Little said Monday that the statement about Clemons’ arm was “not a threat” but a warning about what can happen when someone resists while their arms are behind their back, as Clemons’ were at that point. As officers led the handcuffed woman out of the Waffle House, they said they asked her female companion if she would help pull Clemons’ dress back up over her breasts, but the other woman declined. Her male companion asked for Clemons’ permission and then hiked the dress. As evidence of Clemons’ level of intoxication, Little showed reporters a still photo taken from a surveillance video of the woman holding a garbage can near her mouth as officers were booking her into jail. Little said Monday that Clemons “appeared to be intoxicated” at the time of the incident and was sick later. Clemons has been charged with disorderly conduct and resisting arrest. Her two companions aren’t facing any charges. 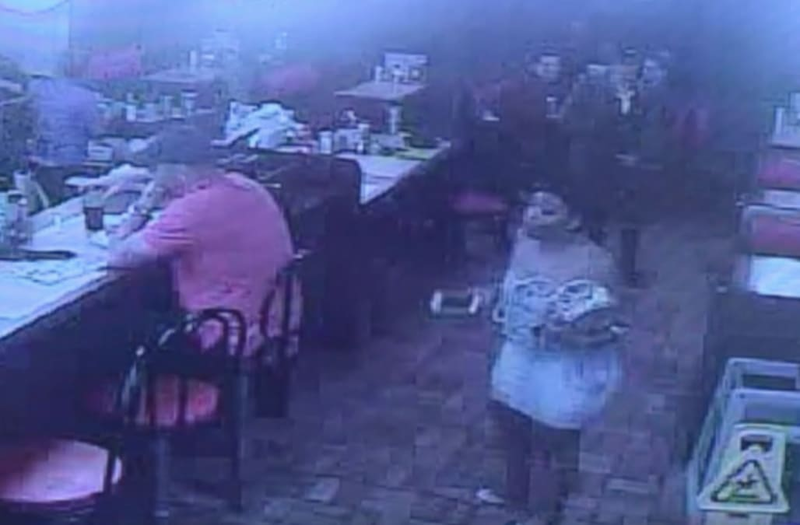 While surveillance video played at Monday’s press conference does show Clemons arguing with a server and later approaching the front counter of the restaurant, her mother, Chiquitta Clemons-Howard, disputes the official statement. Clemons-Howard told AL.com that her daughter and friends were upset when they requested plastic utensils and were charged $0.50 extra for them ― a charge they’d never been assessed in the past. The interaction escalated from there.